The Two of Cups. Love. Intimacy. Connection. Attraction. Harmony. Unity. Joy. Truce. The Two of Cups corresponds to the Sefirot Chokmah, and represents the active, original form and emanation of the idea of Cups. It is the line, the first manifestation of the concept of something other than a singular point, and is the original harmony. The energy of the suit here are not diluted, and this is the first real manifestation of the idea of the suit that we can see. 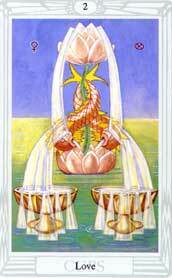 As such, the Two of Cups represents the best of the suit of Cups as we see it; the suit’s energies in harmony with itself. The idea of intimacy remains at the forefront of this card, and is its primary focus; but the idea of intimacy is also expressed through the similar ideas of connection, attraction and unity. The idea of Emotional Force becomes joy and harmony. The idea of fluidity becomes truce (though not the same extent as the card of the same name). This card is in many ways a less powerful version of the Lovers (VI). The Rider-Waite illustration shows a man and woman holding their cups together in what could be either close friendship or love, reaching out to each other. The Thoth art depicts two cups each receiving water from the same source as a sign of connection, reinforced by the intertwining of the tails of two fish; this card emphasizes connection, unity, and peace. In a reading, this card asks you to look at how close relationships with another individual may be playing a role in your life. It is important to remember that this card does not always mean romantic love; it can just as often mean the love between friends. This card also asks you to find joy in the company of someone close to you, to examine your connections to others, to try to achieve harmony, and to look at your attractions to others. Reversed, this card’s energies are blocked somehow; intimate feelings are not being expressed, the feeling may only be going one way, or discord is making union difficult. I’m pretty pleased to find this page. I need to to thank you for ones time for this fantastic read!! I definitely loved every little bit of it and i also have you book marked to see new stuff in your blog.